Fresco of St. Basil the Great, lower register of sanctuary in Church of the Theotokos Peribleptos in Ohrid, Macedonia. Mass of the Feast of the Epiphany, Year C at 5pm. Parish Epiphany Party for all ages, 4pm until 7pm. Shared Table. Sacred Heart Church Hall. Funeral of Chris Cassin, 11am at Sacred Heart Church. We will be using the Storrington setting of the Mass by Marty Haugen. Mass of the Feast of the Holy Family, Year C at 5pm. Mass of Second Sunday of Advent, Year C at 5pm. Registration session for First Communion, 6pm in the hall. 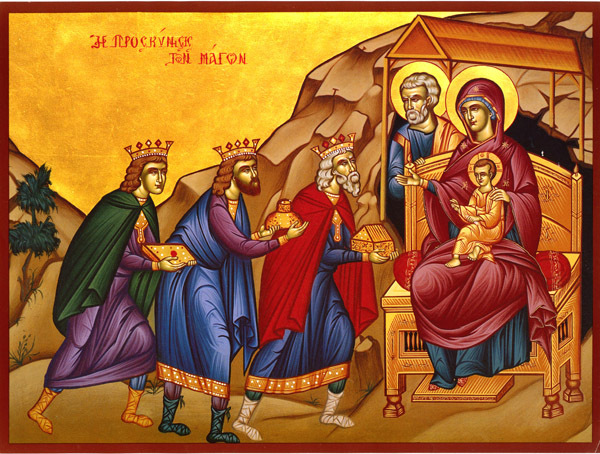 Parish Epiphany Party for all ages, 4pm until 7pm. Shared Table. The crib at Sacred Heart Church, Rugby. When Jesus was born in Bethlehem of Judea, in the days of King Herod, behold, magi from the east arrived in Jerusalem, saying, “Where is the newborn king of the Jews? We saw his star at its rising and have come to do him homage.” Image from fresco in Cappadocia. Celebrate the Epiphany with us at Sacred Heart Church.